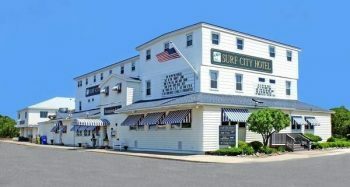 Located a few steps from beautiful Atlantic Ocean beaches, the Surf City Hotel is a historic landmark on Long Beach Island. Located in the family oriented Borough of Surf City, this historic and legendary establishment is open daily from April 1 to Columbus Day weekend in October. Surf City Bistro, The Clam Bar and The Beach Club Lounge are open weekends May through June. Open daily from late June through Labor Day. Limited opening September through October. The Surf City Hotel’s Beach Club lounge offers a variety of musical entertainment on weekends, and four nights during the week. Rock’n’Roll, Tribute bands, and the acoustic duo of the fun loving “The Bill & Andy Show” on most Sunday afternoons.